We couldn't wait to share these Professional Branding session by Photographer and Studio Member Ciesther Parrilla Dela Cruz, of DCPG Photography. We loving having her and her team here at the studio every week. She utilizes the space in such creative ways and we just love her bold use of color!! 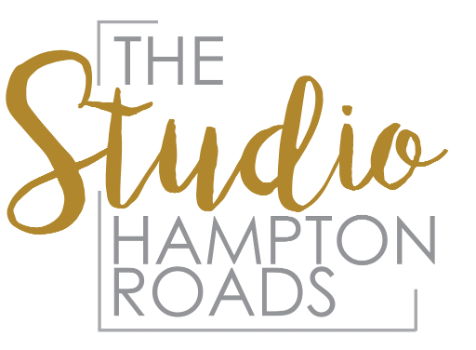 "One of my favorite things about The Studio - Hampton Roads is that we can photograph your session both indoors AND outdoors thanks to the grass and trees surrounding the building. Contending with the insane VA weather is so much easier knowing we can run inside if it rains or is too hot (which, as we all know, are both inevitable). "Rina & Eric co-own a pop-up food cart called Slide Thru #Fam that mashes their love of hiphop with remixes of Filipino and American classics. Since their aesthetic decidedly NOT shabby chic, I opted to shoot in the multimedia room to start with a more blank canvas and ended up using the doorway to create simple framing without being too plain." Carrie is an Associate Project Manager, copywriter, martial artist, B-corp owner of Phoenix Warrior and if you know her, an all-around effervescent encourager. She needed updated headshots and we used the studio to create DCPG's signature personal branding images, which are more relaxed than a standard headshot. We used the cozy feel of the studio to create the feeling of working from home and the Main Suite was absolutely perfect for this. Deborah Rodenhizer - These are great! They capture the professional aspect but also the personalities of those professionals. Great settings too!.